Fort Collins was off the TransAm route, and the immediate problem was how best to get back on track. I decided long ago that I wouldn't concern myself with the "purity" of staying on every inch of the mapped trail, but that didn't mean I wanted to go blaze a new trail if it meant it would take me a week to reconnect. 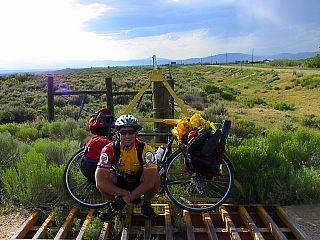 The obvious options I considered were to ride north out of Fort Collins to Laramie then make my way west to the route, to spend 2-3 days climbing back up the 5,000 feet back up the Poudre Canyon to Walden, or to just hitch a ride back to Walden. In the end I accepted a compromise between the latter two. Hanging my bike upon the rack on the back of my truck, I drove back up to Cameron Pass with my friend Rob in the passenger seat. Rob had agreed to come along to bring my truck back to Fort Collins, with the bonus of the opportunity to do some fly-fishing in the canyon on his way back down. Standing there with my loaded bike at 10,276 feet, I wasn't sure how to get started again. While I knew that there was really nothing more to it than to get on and start turning the crank, the rhythm of being on the road seemed to have slipped away from me. Even more surreal, no sooner had I put on my helmet and gloves than Mother Nature broke open a couple of storm clouds and started pouring rain down on us. Inside my head I joked that she was just expressing her displeasure at my long absence from the trail. Getting on and riding suddenly didn't seem all that appealing, but since standing in the rain certainly wasn't a better choice I said my hasty goodbye to Rob, hopped onto my seat, and began the reentry into my voyage. At first everything I did on the bike felt strange to me. I was fortunate that my body remembered how things were supposed to work, but my mind wasn't so sure about it all. My gloved hands on the bars felt detached from me, the seat beneath me felt wobbly, and the rain made me more distracted than I recalled. But somehow without thinking, my legs kept going round and round, the miles started to slip by, and before I knew it the sun had come out and everything seemed right again in my little world. Everything was right again, that is, except for one unavoidable consequence of my two-week break. I had lost my "cycling family" and would probably never catch up with them again. Even though I had ridden almost every day alone, there was always some comfort in knowing that I would meet my fellow westbounders from time to time as we all made our way to Oregon. And even though I had little doubt that I would meet more cyclists now that I had returned to the trail, I was still feeling a little melancholy and lonely when I arrived in Walden to stay for the night. Once in town my first order of business was to put some supper in my stomach before setting up camp for the night. I randomly picked one of the many cafes on the main drag and was studying my maps and savoring my soup when a funny thing happened. Three men walked up to my table and one of them asked "are you the biker?" It was a question that wouldn't have given me pause two weeks ago, but having just left the "real world" it seemed bizarre to suddenly be intruded upon. It turned out that Peter, Stan, and David were also riding the TransAm trail, but since they were all wearing their street clothes it hadn't been immediately obvious to me. In a wink and a flash they joined me at my table and we started talking about our rides so far. Peter and Stan had come from New Zealand to ride the trail, while David is relocating from Boston to California after he finishes his ride. As we talked I noticed something that had happened to me in the time I had been off my bike. Two weeks ago I could have met a new cyclist and within five minutes we might be talking about how frequent our urination was and how the chafing in our private parts was treating us. But during my break I had started to rebuild the wall of privacy that we normally use with strangers, and I found it difficult to even speak about things like where I had stayed and how the weather had been. Once I became conscious of what I was doing I made the effort to speak more openly, but I was still struck by what had occurred. I wondered briefly what it would be like to simply speak openly all the time, but realized that wouldn't work all too well in a society where we routinely ask things like "how are you" without wanting to know the answer. After dinner the three other cyclists left for their motel room while I headed to the city park to camp for the night. No sooner did I arrive there than I met three more people on the trail. 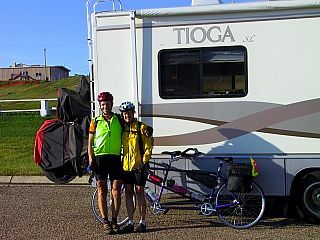 Mark and Emily are riding an unloaded tandem from East to West, while their friend Jackie drives the RV that the three of them stay in every evening. It turned out that they too had just returned to the trail from a short break, and we all bemoaned the fact that we had lost our respective road families. As we talked the idea of trying to ride together the next day naturally presented itself, and although I was quite pessimistic about trying to keep up with an unloaded tandem on my second day back I agreed.